It’s that time again where I wander along the Internet Highway and choose the feline themed items that have captured my fancy. With one notable and heartwarming exception, this week is an homage to working felines. As a working feline myself, I am always fascinated by other cats who have jobs. So, sit back and enjoy this weeks picks. I’m including this one for all you hopeless romantics. This guy just hit it out of the park and I had a little chat with the male human and told him he could have really upped his game with the female human had he proposed to her this way! And for those of you who are concerned, yes, the lady did go home with a ring…..and a kitten! As I mentioned, I am always interested in career cats and this is the first police cat I’ve ever heard of. This is a “rags to riches” story that will make the most grumpy feline smile. Seems Rusik was a stray who was adopted by the customs guards at a checkpoint near the Caspian Sea. One of the most expensive and sought after items in Russia is caviar and, as it turns out, Rusik proved to be quite adept at smelling it-on smugglers. His talents far outshone the police canines and he became top cat at customs. Sadly, his great talent led to his demise but while he was with us, he was a cat of extraordinary ability. Покойся с миром (rest in peace) my Russian friend. Those of you who follow my Wednesday web wanderings know I’ve written about a brewery cat before and it seems as though these brewery jobs are becoming a “thing”. Hoodie works the night shift and lest you think she restricts her job description to mouser only, she is quite talented. She often photobombs the brewery Instagram account and the brewery’s Facebook page. Hoodie has a pretty purrrrfect life, chasing mice, napping on the desk or comfy sofa in the office and sometimes sneaking into the tasting room where snacks can be found. Cheers Hoodie! Well, there are jobs and then there are JOBS, like important government jobs and this former stray has quite the cushy career. This stately feline has a name that matches his impurrrtant duties, Palmerston. The name comes from Prime Minister Viscount Palmerston, a foreign secretary who also served as Prime Minister almost 200 years ago. When I told my brother, Oliver about Palmerston, Oliver was quite interested. After his recent failed cat-i-dacy for Purresident, he felt that perhaps there was still a glimmer of hope for some sort of purrlitical career. You can wander over to FelineOpines.com and read about Oliver’s campaign and the Kitty Cat Party. Lily here. As you can see, I’m dressed in my best to host our Linky Party. Sure hope you enjoy my picks for favorite blog posts from the last party and please join us. I would love to hear from more felines out there in InternetLand. Welcome to the Pet Blogger Showcase! This is the place for you to show off your favorite family friendly pet related posts, find other great posts to read, show some love to other bloggers and maybe be featured on one of the host blogs! I loved this story and wanted to learn more about humans who foster pets. My humans fostered a year ago but they were “foster failures” and Alberto and Oliver are still with us. Fostering is so important and for the humans who are called to do this I give them a two paws up and say a heartfelt “THANK YOU”!! I know, this is about puppies but there is wisdom for humans with felines to learn as well. This takes me back to the fostering topic as the female human is quite convinced that the early socialization Alberto and Oliver received helped shape their personalities to be calm, human friendly felines. Alberto here. I’ve been purrrusing the internet looking for new and unusual feline themed stories and have some great ones for you this week. As next week is what the humans refer to as a “holiday” my purrsonal assistant may not be available to post my regular Wednesday feature. We will post an original photo and send Howl-iday wishes though. In the meantime, enjoy this week’s features. The human photographer Seth Casteel, is known for his books, Underwater Dogs and Underwater Puppies and has now turned his attention to shelter kittens. He captures some special shelter kittens with names like , Chicken, FruityPebble, Fuzzbucket, Doodlebug, and Jennifer, in mid-flight pounce. This wonderful human is highlighting the fact that there are between 30 and 40 million stray cats in the US. An estimated 1.4 million are euthanized in shelters, unable to find safe and loving homes. This book illustrates the joy of kittens and the fact that there are many cats and kittens who need forever homes in shelters all across the country. 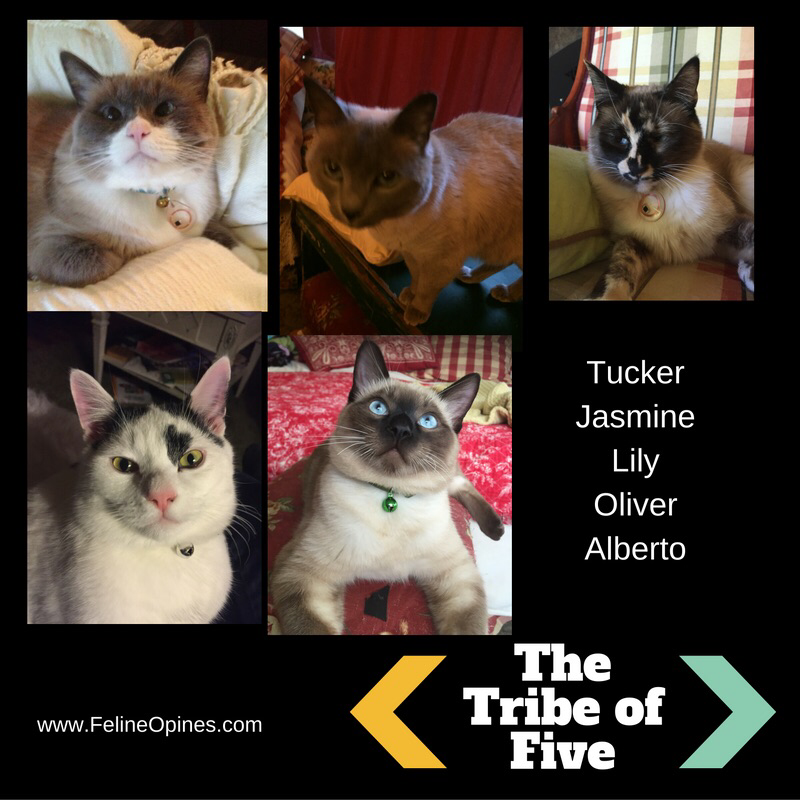 Every one of us in #TheTribeOfFive were adopted and we are all for anything that helps other felines find forever homes too. As my regular readers know, this working feline loves stories about other working cats. This is a pictorial tribute to felines that work in “Boozers” as the English refer to the establishments also known as pubs. I think working in a pub would be quite interesting and I wonder, do they get tips like the human bartenders do? The #TribeOfFive is pretty spoiled and we have lots of great toys and feline themed items. As a matter of fact, number 8 on the list is something we already have (and have reviewed), Music for Cats (we recommend it highly). There were many on this list that I found appealing but I finally decided the KitNipBox was my favorite. It works on so many levels, we felines get a gift a month and a portion of the monthly cost is donated to animal welfare organizations. It just doesn’t get any better than that! ‘Lest you think I’m completely selfish, I am also interested in what gifts are best for feline-loving humans. Our friends at Katzenworld and their guest poster, Mike James (who describes himself as a tech-obsessed, cat-loving content writer working with Best VPN) provide some excellent choices for your favorite humans this Christmas. I purrrused the list and can’t decide what I like best, the remote cat toys or the Meowlingual, cat translator. While it would be pawsome to have red dots and other kitty delights moving around the house while the humans are at work, it would be very handy for my humans to have a Meowlingual translator too. Just think, I could sit on the computer keyboard and dictate my Walk Through the Web Wednesday posts to my purrsonal assistant! While I’m on the subject of translating “cat-speak” if you don’t have a Meowlingual cat translator, you can still learn how to understand a bit of feline talk. You will be able to discern the difference between the trill, the bip, the yowl, the chatter and other feline expressions after reading this post by Care2. At our house, every one of #TheTribeOfFinve has some Siamese heritage and that means some are quite “yakky”. Sometimes it’s almost like a feline symphony at our place! While I always thought getting a kitten into the White House was a bit of a stretch, my running mate Olive, from Three Chatty Cats and I were always hopeful. We do hope that there will be a “First Feline” in Washington who will take our needs and concerns under advisement. The Kitty Cat Party will rise again and in the meantime, thanks for your support and today, be sure and thank a veteran for their service! I hope you enjoy my selections this week, you’ll meet some interesting felines and learn about a product that will revolutionize the cocktail hour in every home. And don’t forget, if you have a great story you’d like me to share on my Walk Through the Web Wednesday segments, just give me a meow and leave a comment. The owners of a wine store met a feline and thought they would find him a home. The feline, named Jake, had other ideas. He loved the store so much, he’s now the “Meow-an-ager”. Now, before you get on your high horse and decry the fact that this cat has a job, it was his choice and Jake holds court at his store, seeing his admiring public (many bearing gifts) on a daily basis. Two paws up for Jake who landed himself a cushy life. While I’m on the subject of wine….Jake might recommend these libations to his feline customers. Cats can choose from a nice Pinot-Mewo or a MosCATo from Apollo Peak. If you think this is a joke, you’re partly correct. That’s how the whole idea started but now the wine is sold world-wide. And before you worry that this is not a good idea for felines, the creator of Cat Wine used to work in the pet food industry so he understands the fine feline palate. Can’t wait for the weekend when the humans and I can share a cocktail. When you visit the True Value hardware store in Crested Butte, Colorado you may meet Jingles surveying his domain. Technically,. Jingles is a working cat but his job description is much more lofty than “store employee”. His influence in the community is such that his birthday has been declared a holiday. Way to go Jingles! I’ve heard of shop cats, library cats, railroad station cats and even felines with political positions but I’ve never heard of a cat that guards an ancient and important place, until I heard about an orange Tabby who guards the ancient pink city of Petra in Jordan. The folks from Far Away At Home met this fine fellow on a trip there. Take a look at his photo, I think he has sort of a mystical look that’s perfect for guarding ancient relics.